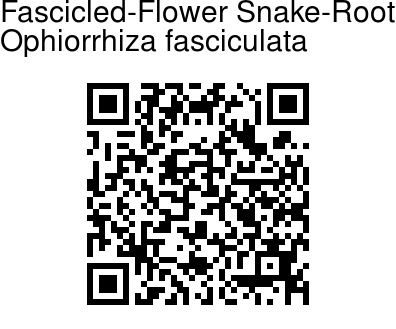 Fascicled-Flower Snake-Root is a perennial Herbs or subshrub, erect, up to 50 cm tall. Stems are hairy to hairless. Leaves occur in nearly equal pairs. Leaf-stalk is 1-1.5 cm, hairy. Leaf-blade drying papery, sometimes darkened above, pale below, elliptic to lanceshaped-elliptic, 8-12 × 3-6 cm, hairless, base blunt to wedge-shaped, flat, tip pointed, secondary veins 10-13 pairs. Stipules are narrowly triangular, 4-10 mm. 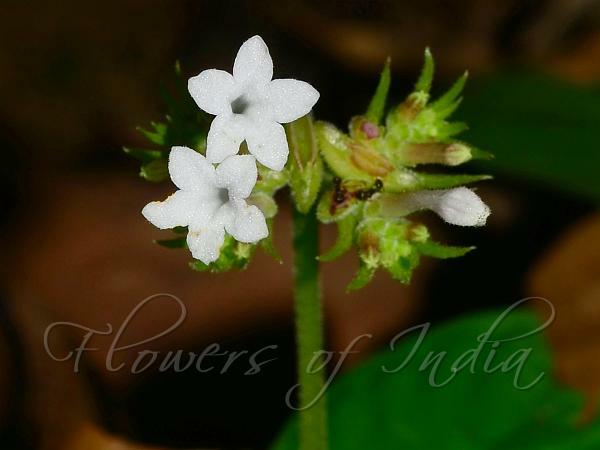 Flowers are borne in congested several flowered fascicles, atop a stalk 1-8 cm long. Branched portion 1-2 cm. Bracts are ligulate-lanceolate, 6-12 mm, persistent. Flowers are nearly stalkless with sepal cup densely velvet-hairy. Hypanthium is compressed cylindrical, 1-1.5 mm. Sepals are ovate to triangular, 1-1.2 mm. Flowers are white, sometimes flushed with pink, drying yellowed, tubular-funnel-shaped, outside velvety, tube 1-1.5 cm, inside hairless. Petals are ovate-oblong, 1.5-2.5 mm. Capsules are compressed rhombic, 1.5-4.5 × 4-10.5 mm, hairy. Flowering: June-August. Identification credit: J.M. Garg Photographed in Durtlang, Mizoram.